97262 Size: 60" H x 1.13" W x 1.13" D Features: -Ideal for heavily soiled areas. -4-Ply cotton/synthetic blend cut-end yarn provides excellent absorbency and durability. -Blue yarn keeps mop looking like new. 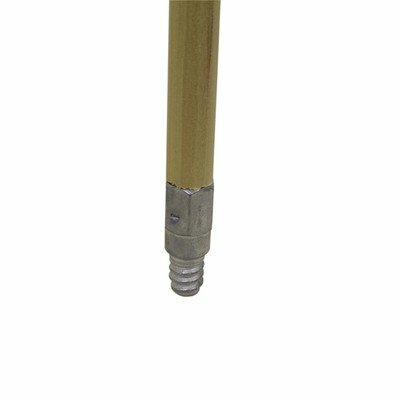 -Handle withstands heavy use. Product Type: -Mop Handles. Generic Dimensions: -1.25'' Narrow band. Dimensions: Size 60" H x 1.13" W x 1.13" D - Overall Height - Top to Bottom: -60 Inches. Size 60" H x 1.13" W x 1.13" D - Overall Width - Side to Side: -1.13 Inches. Size 60" H x 1.13" W x 1.13" D - Overall Depth - Front to Back: -1.13 Inches. Size 60" H x 1.13" W x 1.13" D - Overall Product Weight: -1.42 Pounds. Size 60" H x 1" W x 1" D - Overall Height - Top to Bottom: -60 Inches. Size 60" H x 1" W x 1" D - Overall Width - Side to Side: -1 Inches. Size 60" H x 1" W x 1" D - Overall Depth - Front to Back: -1 Inches. Size 60" H x 1" W x 1" D - Overall Product Weight: -1.33 Pounds. Size 72" H x 1.13" W x 1.13" D - Overall Height - Top to Bottom: -72 Inches. Size 72" H x 1.13" W x 1.13" D - Overall Product Weight: -1.75 Pounds. Size 72" H x 1.13" W x 1.13" D - Overall Width - Side to Side: -1.13 Inches. Size 72" H x 1.13" W x 1.13" D - Overall Depth - Front to Back: -1.13 Inches.